Oris proudly presents the Oris TT1 Day Date - the latest offering from the Oris Motorsport Collection. Although inspired by Formula One, the TT1 belies its track origins with its bold white appearance and sleek, stylish design. Featuring a three piece stainless steel case, white polished Ceramic top ring, stainless steel crown and a screw down case back with mineral crystal, this beautiful timepiece truly emerges as an evocative lifestyle accessory. Style also features in the design of the watch. The introduction of the white silicon shock absorber provides the ultimate protection while maintaining the watch’s bold personality. The flexible white rubber strap with an easy adjustable length system has been developed to provide the perfect fit. The TT1 Day Date is for those in control of their fashion identity. The Oris TT1 Day Date emerges from the intensity of the Formula One arena as an iconic statement piece for men and women. Automatic mechanical movement SW 220, with red Oris rotor with hour, minute and second hand from the centre, as well as day and date. 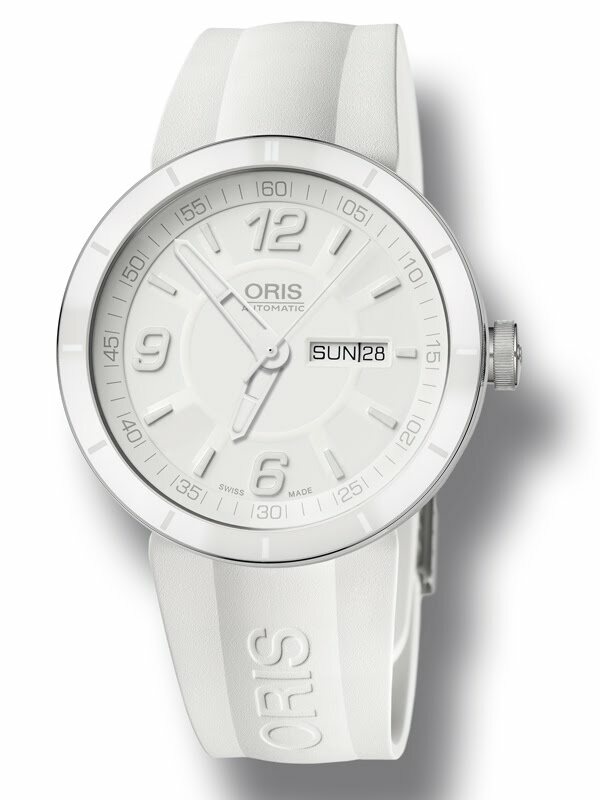 Stainless steel case with white ceramic top ring and hour indications. White rubber strap with easy adjustable length system or multi-piece metal bracelet; both with double pusher folding buckle.